Porch roof kits use an EPDM membrane and water base adhesive to provide you with a sleek and durable roofing system. What’s more, online tiles or sheets they are quick to install and require no specialist tools. 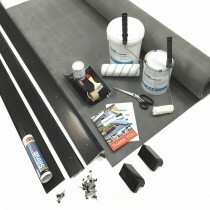 Our porch roof kits include the rubber membrane, adhesives, tool kit and more. It therefore provides you with everything you’ll need to for the painless installation of a rubber roof on your porch. The kits also contain an installation guide walking you through each of the necessary steps. If you have questions about our range of porch roofing kits, simply call our team on 01295 565565. We’ll help you choose the right porch roof kit for you and will have it delivered to you as soon as possible. With competitive prices and our price match promise, you’ll also make huge savings on your project.